This post was contributed by Professor Bill Bowring from Birkbeck’s School of Law. 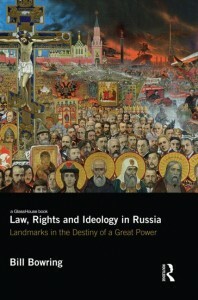 Professor Bowring’s new book, published by Routledge, is entitled Law, Rights and Ideology in Russia: Landmarks in the Destiny of a Great Power. My new book, published on 5 April 2013, is not a narrative of Russian history; there are several already. I am a lawyer, but the new book is not a legal textbook. Instead, I dig deep into some key episodes from the 18th century, when law as an academic discipline began in Russia, to the present day, with the ideology of the Putin regime, and its impact on the Russia’s relations with the European Court of Human Rights. My interests cross the borders between law, history, politics and philosophy, and I draw from many Russian language sources. And I am the proud possessor of a Reading Room Card issued in 2011 by the Institute of Scientific Information on Social Science of the Academy of Science of the USSR (the INION Library) to Comrade Bowring B. They are still using the old cards. The Russia authorities have tried to exclude me from Russia a couple of times – I was thrown out in 2005 and 2007 – but have returned many times. From my first visit in 1983 Russia has got under my skin. This year I have already been to Russia three times, most recently to Ioshkar-Ola, the capital of the Republic of Mari El. You have not heard of either! The Mari people speak a language related to Finnish, and their religion is Shamanism – they worship in the forests. Russian identity contains unique ideological ingredients. First is messianism, the idea that Russia has a sacred task, of saving the world. When Constantinople fell in 1453, Moscow was promoted as the “Third Rome”. In the USSR Moscow became a “Fourth Rome”. The ideology of the Putin regime contains elements of Eurasianism, intended to unite the four traditional religions of Russia – Orthodoxy, Islam, Judaism and Buddhism – in opposition to Western materialism and consumerism. The related concepts of “sovereignty” and “sovereign democracy” have their roots in the thought of the German conservative Catholic – for a time Nazi – thinker Carl Schmitt. Russian intellectuals have been divided between Slavophiles, the inheritors of messianism, and Westernisers, who believe that Russia must emulate the success of Western Europe. I focus first on the first Russian professor of law to teach in Russian, Semyon Desnitsky, in the time of Catherine the Great. He was sent to study at the University of Glasgow from 1760 to 1767, at the time of the Scottish Enlightenment, attended lectures by Adam Smith, successfully defended his Doctorate on civil law, and was Professor of Law at Moscow University from 1767 to 1787. He greatly influenced Catherine the Great and translated William Blackstone’s “Commentaries on the Laws of England” into Russian. Russia lost the Crimean war, a great shock after victory against Napoleon in 1814. Reform was essential. Not only did Tsar Aleksandr II abolish serfdom in 1861, his Great Reforms of 1864 included the introduction of trial by jury, based on English models, which continued until 1917, and has now been re-introduced in every part of the Russian Federation. Contemporary accounts bring out the dramatic significance of jury trials, independent judges – and Justices of the Peace. In my other chapters I explore the thought and tragic life of the most original Soviet theorist of law, Yevgeniy Pashukanis. I trace the paradoxes of Soviet international law, and show how traditions of regional autonomy in Tsarist and Soviet Russia helped to bring about the collapse of the USSR in 1991. Why did Russia, after the Soviet insistence on non-interference in internal affairs, join the Council of Europe in 1996 and ratify the ECHR in 1998; and why did the Council allow Russia to join, when the First Chechen War was still raging? My reader will not have answers to every question; rather, a degree of understanding. 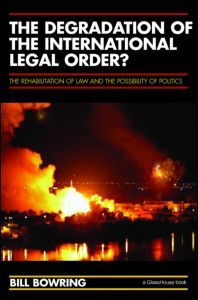 In 2008, Professor Bowring published The Degradation of the International Legal Order? The Rehabilitation of Law and the Possibility of Politics – also with Routledge. This will shortly appear in Russian translation, with the publisher Novoye Literaturnoye Obozreniye (New Literary Review). Category: Law Tags: Politics society and law, Russia by Bryony. Great reply, Olga – thanks! We will discuss! Doesn’t messianism apply to the US as well?